Note: This is NOT a paid or compensated review, but a review of two products that I purchased for my own use. I enjoy sharing information about products you may like or find useful and you’ll always receive my honest and unbiased opinion. When do we use treat dispensing toys? Uh, pretty much every day! If you haven’t tried any of these yet, let me explain how useful they are. You fill the toy with a few treats or kibble and your pup goes to work figuring out how to get the treats out. 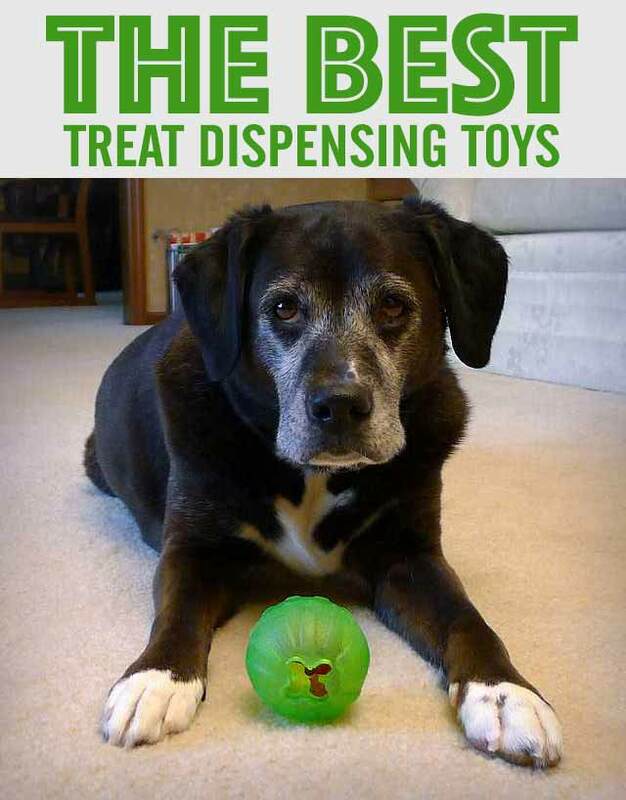 But there’s a lot more to these toys than just doling out food or treats, check out the other benefits below then read Haley’s recommendations for the best treat dispensing toys. Dogs enjoy the challenge and reward of working for food. I often start off by hiding the filled treat ball to combine it with a game of Find It. Dogs love to learn new things and treat dispensing toys and puzzles can provide mental stimulation while your pup figures out the toy. They connect your dog to their natural instinct of hunting and foraging for food. What’s better than your dog burning a few calories while having fun and working for those treats? Treat dispensing toys are perfect for dogs that have energy to burn, especially in the wintertime or on rainy days when your dog might not get outside as much. Most of these toys will get your pup moving and provide some additional activity beyond their normal walk or exercise routine. Give your dog a filled toy as you leave the house so they have something to focus on. You can help a kibble-fed dog lose weight by putting all or part of their meal in a food dispensing toy. Many destructive behaviors like digging, chewing or barking are the result of boredom. Treat balls and toys can give your dog something else to do. They’re perfect for feeding dogs that wolf their food down too fast. Those are some pretty good benefits, right? Haley’s tested a lot of these toys but two of them are at the top of her list as the best treat dispensing toys. Here they are! Haley’s first pick is the Toys “R” Us® Ball Treat Dispenser Dog Toy which is also sold as the Omega Paw Tricky Treat Ball. This ball is good for getting your dog active and moving. Just drop some treats or kibble into the hole in the ball and your pup will roll it around or pick it up and drop it until the treats come out. 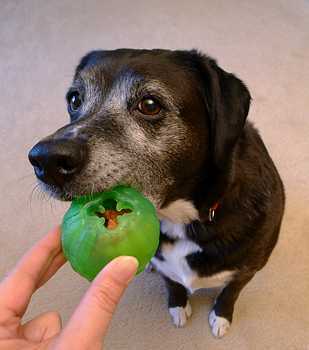 The ball has a lip around the hole to prevent the food from coming out to easily, so it makes your dog work a little longer to remove all the treats. The ball is made from a somewhat soft vinyl with molded craters on the outside, so it’s easy for your pup to pick it up and it’s easy on wood floors if it’s dropped. The ball comes in different sizes and can hold a large quantity of food or treats. A couple of notes about this ball, you’ll want to stick with using hard treats or food since there’s no easy way to clean the inside of the ball and it’s not made for aggressive chewers. Haley’s second pick is the Starmark Chew Ball Treat Dispenser Dog Toy and I have to say it’s probably her favorite because it’s so versatile. It not only dispenses treats but it’s also a bouncy ball and it floats. As a treat dispenser, it can be rolled along the floor but Haley normally settles down and chews on it instead. The ball is soft and pliable yet it holds up amazingly well to strong chewing. 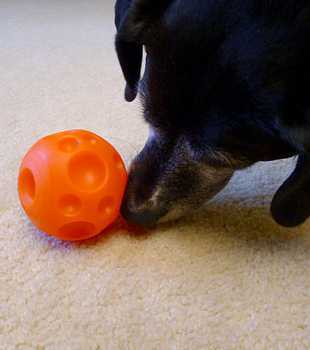 You push the treats through the tabs on either side of the ball then your pup will work on getting them out. You can use a variety of treats with this ball and you can also trim the tabs with scissors if you want to create a bigger opening. The ball comes in different sizes and it’s pretty easy to clean the inside with your finger since it’s pliable. There’s only negative point about this toy, it doesn’t always work well with large, crunchy treats. If your dog chews on the ball like Haley does, the treats get crunched up into crumbs and fall out of the holes. The ball is very durable but aggressive chewers might do better with a Starmark Pickle Pocket or one of the Kong Extreme toys. 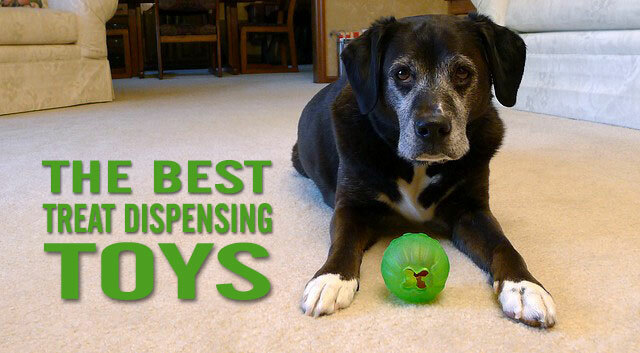 These are the best treat dispensing toys we’ve tried and both are available at PetSmart and other retailers. I like that each has a slightly different purpose. The video below shows how one is best for actively being pushed around and the other is better for settling down and focusing. Both are great boredom busters for Haley and she has more fun working for her treats rather than having them handed to her freely. Different dogs like different types of toys and there’s no shortage of options when it comes to treat dispensing toys and puzzles. Shop around and find a few that your dog might like or you can make your own by using items from around the house, like water bottles or cardboard boxes. Have you tried these or any other food dispensing toys? What are your dog’s favorite picks? These are cool toys. I’ve not seen these ones. My nephew Logan has some toy dispensing toys that are fun too. Great idea especially for dog’s that have to be home alone, they don’t get bored. Great tips. Yes, they’re great for when you leave the house and most dogs really love them! I’ve been meaning to try some of the new puzzle toys that I’ve been seeing lately. Haley is so cute rolling that ball on the floor to get the treats out 🙂 We might have to try one of those because Cocoa loves a challenge. It is so nice to have a review like this before going out to buy toys. They get expensive especially for Cocoa because she seems to chew through most of them!! Kong has been our winner so far!! Hope you are having a nice day!! The Kongs really are one of the best brands for crazy chewers. Maybe you could try some homemade cardboard box puzzles for Cocoa. Try putting a box inside of a box, inside of a box, etc. with a treat or two in each box. Sometimes I’ll put a few larger treats inside of an empty water bottle for Haley and it takes her awhile of throwing the bottle around before they come out. Yes, maybe a treat dispensing toy is just the thing to help distract Taffy from digging up rocks when she’s outside. You’ll have to let me know if you try it! Fantastic! 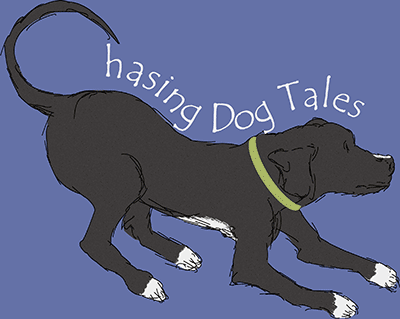 They’re so much fun for our pups. ? Bailey loves her treat dispensing ball. I use it to entertain her when I have to leave the house. Our biggest problem is finding one that will survive her “big girl teeth” now that she’s a grown dog. I’m going to look for the balls Haley recommends. I would try the green Starmark ball over the orange ToysRUs ball then, but you may end up using an Extreme Kong if Bailey’s a super, aggressive chewer. Haley’s Starmark ball has outlived all the others, she’s had it for at least five years and it’s still going strong. ? I used treat dispenser toys a lot with Harley & Leo, for some reason, with Jax around Harley doesn’t like for him to have one, but that was when they were both younger. I took like all the benefits they provide, so you’ve inspired me to bring them back out again and try. Thanks. I would give it another try now that Jax is a little older. It sounds like they’ve come a long way towards being loving brothers. ? First off, Haley is adorable with her food toys. I just loved watching her having fun. We are huge fans of food toys. Until we moved onto the boat, Honey ate every meal out of a food toy since she was 8 weeks old. We started by putting kibble in a soda bottle, turning it on its opening, and encouraging her to knock it over. We also used a tug-a-jug where she had to tug a string to get the food out. We also had a Kong wobbler and a giant Kong. And sometimes I’d just tape a bunch of boxes together hiding treats deep inside for her to look for. We gave up food toys when we moved onto the boat because I’m worried about stray bits getting into pumps and causing problems. But your post is making me reconsider. Perhaps I need to buy a few more food toys for her to play with off the boat. I bet Honey would love that! It sounds like she’s adapting really well to life on the water, but doing some of those fun activities when you’re on solid ground would be exciting for her too. Great plan! I bet that’s a common issue with people that have two or more dogs, especially with the balls they roll with their noses or puzzle toys. I can just imagine two dogs looking at a puzzle toy and one thinking, “Just get out of the way and let me do it!” ? Cute video! We used to have a treat dispensing cube that our beagle would push around the house, but once we moved to where we mostly have tile and hardwood, it just didn’t work anymore. It couldn’t get enough traction to tumble over and would just slide, so the treats wouldn’t tumble out anymore. Poor, frustrated beagle! I got Rita a Tug-a-Jug but I rarely get it out for her because she gets SO frustrated with it. She makes these snorty pig noises when I get it out. She’s nutty. Haha, you’ll have to video Rita’s pig noises sometime, that sounds hilarious! If you want to try another type of toy, the orange ToysRUs ball works great on wood and tile floors. It’s made from a softer vinyl so it wouldn’t just slide across the floor like the cube. Treat dispensing toys are the best! Misha is a quick eater. Put food in the bowl and it’s gone in 3 seconds. I have 4 different treat dispensing toys. That’s what she gets her meals in. She love playing with them and they make her food last a lot longer. By the way, she has the same orange ball in small and large size. It’s funny to see a 7 lb. dog carry the large on in her mouth. How cute! I would love to see Misha carrying and rolling around the larger orange ball. Since it’s a softer vinyl, it must be easy for her to pick up with her mouth. The toys are really nice for pups like Misha that eat their food fast. Treat toys are great aren’t they?? Out of my 3 huskies, Koda loves the treat toys best. The other two will play with them, but lose interest… Koda on the other hand, will keep at it until he has every last crumb out of the toy! Koda probably gets some leftovers from the other toys too, lol! NICE!! We use the Kong ourselves, but for snack time. It gets filled with pineapple, topped with pumpkin and is frozen for a couple of hours. If I had to guess, I would say this is Delilah’s favorite meal of the day. This dog LOVES her Kong. I always used a Kong when Sampson was a puppy, to keep him occupied when I left so he wasn’t worried or scared. He loves the Kong too, but not like Delilah. Some mornings after our walk, he will run in, grab his Kong and play with it. It’s a really great toy. Mmm, pineapple and pumpkin sounds like a winning combination! I’ll have to try that with Haley and see if she likes it. Mr. N likes the Kong wobbler and another one that I can’t remember the name of. That’s one toy I haven’t tried yet, the Kong Wobbler. I’m going to have to pick up one of those soon for Haley. The tug o jug seems to be a hit with a lot of dogs! Oooh, foody toys are the best! So many treat toys to choose from too! ? This would be perfect for our dogs!!! Thank you for the great article. Thanks so much, Dave! I hope your pups love them and I think you’ll love them too. ? Haha! I can imagine James doing that in real “lab” fashion. That’s why we love our labs so much though! ? Haley’s so cute! I figured the treat dispensing toys can probably be good for my Sheltie Pom mix. She’s getting fat, and it might be a good form of exercise for her! Yes, they’re perfect for that, Leslie! ? ?